Preheat the oven to 180c, gas mark 4. 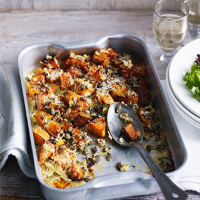 Place the pumpkin or squash in a shallow 2-litre ovenproof dish or roasting tin. Scatter over the garlic, rosemary, cumin and seasoning. Pour in the stock and bake for 40–45 minutes until the squash is almost tender. Increase the oven temperature to 200c, gas mark 6. Pour the cream over the pumpkin and scatter with the pumpkin seeds, breadcrumbs and goat’s cheese. Return to the oven for a further 12–15 minutes until the top is bubbling and golden. Serve with a green salad and crusty bread. Make this in advance, then cool and freeze until needed. Thaw thoroughly before reheating at 180c for 20 minutes. Cover the top with foil if the topping starts to get too brown. The goat’s cheese is helped by a refreshing white, but one with enough body and texture to hold its own against the pumpkin. The Loire is the perfect hunting ground for wines like this. Try La Grille Classic Barrel Fermented Chenin Blanc, Anjou, Loire, France.